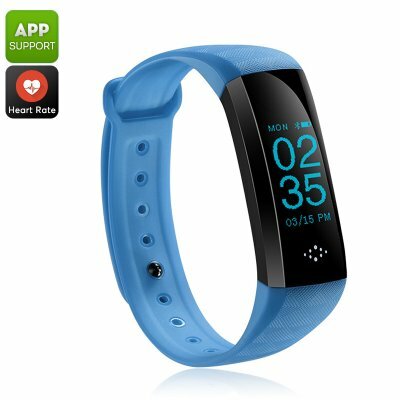 Successfully Added Fitness Tracker Bracelet - Bluetooth 4.0, Heart Rate, Blood Pressure, Pedometer, Distance Counter, Sleep Monitor, IP67 (Blue) to your Shopping Cart. With this smart fitness tracker bracelet, you’ll be able to accurately keep track of your daily activity levels. It comes with an IP67 waterproof design. This means that you’ll be able to use it in any weather and even wear it inside the shower. Through Bluetooth 4.0, you’ll be able to synchronize it with the vast majority of iOS and Android smartphones. When used with the dedicated mobile application, you’ll be treated to an abundance of smart health and fitness data to help you analyze your activity levels and daily progress. It even treats you to call and message reminders. This means that you’ll never again miss out on an important update from your friends or family. The fitness tracker bracelet features a crisp 0.96-Inch display. This touch screen comes with adjustable brightness so that you can use it in any environment. The 80mAh battery powers your Bluetooth smart watch for up to 120 hours on a single charge. This is enough to enjoy all its smart health features for days in a row without needing to worry about battery life. From now on, you’ll always be able to keep track of the total number of steps you took throughout the day and distance you covered. This has been made possible by its pedometer and distance tracker. The watch furthermore comes with a heart rate monitor and blood pressure sensor to keep track of your current stamina and health levels.